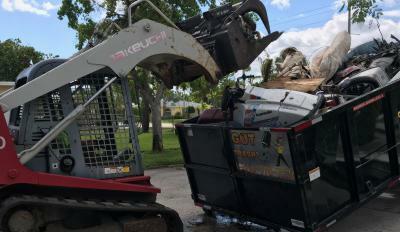 After a storm or demolition, yard debris removal in Fort Lauderdale can be a burden for many residents, commercial business owners, and industrial clients alike. XS Trash is a leader in debris and trash removal services, with licensed Bobcat operators at the ready. Our large company trucks measure in at 21-yards long, putting them among the largest in the industry and reducing the number of journeys we must make for each yard debris removal in Fort Lauderdale. Call today for a FREE estimate on our services and ask about same-day service. The choice is yours when our company truck arrives to load it yourself or simply point our professionals toward the debris that needs to be cleared. For heavy debris and bulk items, our licensed Bobcat operators can help speed the process along. They are skilled and can maintain a safe work-zone while you wait. When you call today you can ask about our price matching ability. This is a great way to get reliable services for your yard debris removal in Fort Lauderdale while ensuring that you don't pay a penny more than you have to. Combined with our volume/load concept of charging, XS Trash is sure you will be satisfied with our fair rates and flexible scheduling.